Top employers use personality profiles to help them hire the right people for the right job. A personality assessment will also help you learn about yourself so that you make the right decisions to lead a fulfilling life. Introvert or Extrovert? The personality tests on this page will help you understand your behavior patterns, thinking style and emotions. The TypeFinder® personality test meets these criteria, and adds even more value. This test is one I recommend to all my clients. This test is based on the 16 personality types described by Myers & Briggs and takes about 20 minutes to complete. It provides excellent information about your personality type - plus additional career and relationship advice. The feedback you receive is really comprehensive. If you want success in relationships you need to know which personality type is most compatible with yours! Find out now with this free personality test! Please take the Big Five personality test after you've completed the TypeFinder® personality test for a well rounded assessment of your personality. If you want to learn more about your personality there are excellent assessments based on the Five Factor model that will help you learn more about your personality. Read about the sixteen Myers Briggs personality types and find out about careers and relationships that suit your type. 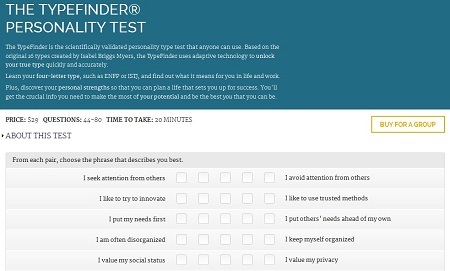 If you want a free personality test I recommend the shorter research version of the TypeFinder® personality test. This test will help you discover your 4-letter personality type based on the work of Myers & Briggs. Access your TypeFinder® personality test here. When you've finished the online test choose the next assessment from the list below. If you've finished them all use the links below to return to your starting point.